If you read my Predictions for 2012, you’ll recall that #6 was “The Corporation” Becomes A Central Societal Question Mark. We aren’t very far into the year, and signs of this coming true are all around. The “Occupy” movement seems to have found a central theme to its 2012 movement around overturning “the corporation as a person,” and some legislators are supporting that concept. We’ll see if this goes anywhere, but I wanted to note, as I didn’t fairly do in my prediction post, the role that “The Corporation” played in my thinking. I finally watched this 2003 documentary over the holidays. 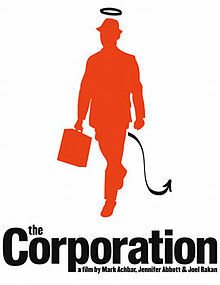 Its promoters still maintain an ongoing community here, and it doesn’t take long to determine that this film has a very strong, classically liberal point of view about the role corporations play in our society. If you can manage the film’s rather heavy handed approach to the topic, you’ll learn a lot about how we got to the point we’re at with the Citizens United case. Obviously the film was made well before that case, but it certainly foreshadowed it. I certainly recommend it to anyone who wants the backstory – with a healthy side of scare tactics – of the corporation’s rise in American society. My next review will be Ray Kurzweil’s The Singularity Is Near, a 2005 book I finished a few weeks ago. I’m currently reading Steven Johnson’s Where Good Ideas Come From: The Natural History of Innovation, which is a pleasure. I also enjoyed Johnathan Zittrain’s book, and hearing him speak at SuperNova a couple years ago. The event you participated in with him (earlier post) this week sounded interesting too. Apologies in advance for the self-pimping but you might be interested in my book Humanize: How People-Centric Organizations Succeed in a Social World (http://amzn.to/vHWiJu) – our core premise is that social media is powered by what makes us human, but our organizations are built to be like machines – with predictable inputs and outputs – and when we try and force one into the other nothing works like it should. We draw from some of the books you mentioned. Thanks, look fwd to reviewing! Previous Previous post: Google+: Now Serving 90 Million. But…Where’s the Engagement Data!